Like the unexpectedly lovable robot binman WALL-E, the central protagonist of Pixar's latest outing, Up, makes for an unlikely hero. 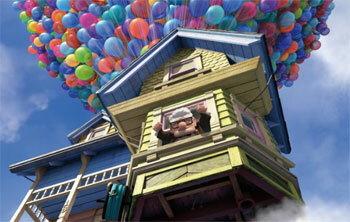 Retired septuagenarian balloon seller Carl Fredricksen (voiced by Edward Asner) is a curmudgeonly sort, isolated and achingly lonely since the death of his beloved wife, Ellie. Together, the couple dreamed of setting off on a grand adventure to the lost world of Paradise Falls in South America, following in the footsteps of their childhood hero, the explorer Charles Muntz. But somehow life got in the way, and Ellie dies before their dream can become reality. Oh folks, get those tissues out, because this little back story is the most beautiful, tragic thing you'll ever see on screen. The gently soaring music, the charming images and the sad, true, universal story of love and loss… I'm welling up just thinking about it. But if that's starting to sound a bit miserable, never fear, because adventure and excitement are right at hand. Condemned to spend the rest of his days in a retirement home, Carl ties thousands of helium balloons to his house (c'mon, everyone knows that works) and sets off for Venezuela. Of course, what he doesn't know is he has a stowaway on board, the eager Adventure Explorer Russell (Jordan Nagai), who, it transpires, has family problems of his own. Next thing we know, the pair are encountering mythical creatures, talking dogs (dog lovers, you are going to adore this film: the conversational canines are simply superb) and Carl's not-so-heroic-after-all hero, CharlesMuntz (Christopher Plummer). Buckle up, because you're in for a rollercoaster ride that's probably even more exciting, breathtaking and riotous in 3D than it is in migraine-conscious 2D. 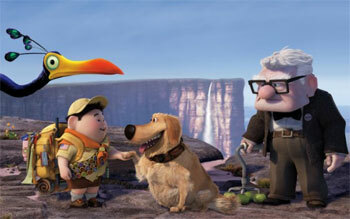 In short, Up is an absolute joy from start to finish. It almost goes without saying that the animation is top-notch and the loving attention to detail utterly delightful, but the Pixar peeps have really excelled themselves here. Our disparate crew of characters seem far more real and rounded and lovable than your usual cardboard cut-out live action heroes and the script simply bristles with wit and insight, pathos and spirit. Rarely can a film have you howling with laughter one minute and streaming with tears the next: ET is perhaps Up's closest rival here. And like that Spielberg classic, Up richly deserves a place in family film heaven, proving, as it does, that adventures don't have to feature exotic locations, flying houses, aliens and beasts. Sometimes the greatest adventure is just to live and love.